Why Living In The Philippines? Why should you decide to live or retire in the Philippines? There are many reasons for and against the Philippines and there are other options, too. Here I will give you some reasons that speak for the Philippines. One of the main reasons for somebody who want to live in the Philippines is of course the climate! Even if it rains all day long, it never gets colder than maybe 20°C or so but most of the times it's around 30°C. That's good for your bones and your body, specially when you feel a pain already due to cold. The Philippines is a country where other people do their holiday, so that's another good reason to stay there for ever. What could be wrong with a place where people spend their holiday? It's easy to stay in the Philippines and not as complicated as in Thailand for instance. You can even stay in the Philippines without a visa for u to 24 month, before you would have to leave the country for a day or more, to start your visa extensions again. In Thailand you have to leave the country every 30 days without a visa or every 60 or 90 days with a tourist or Non Immigrant Visa. Specially when you are married with a Filipina, you can easily apply for a permanent residence which will be granted in 99% of the cases. Life is a beach! 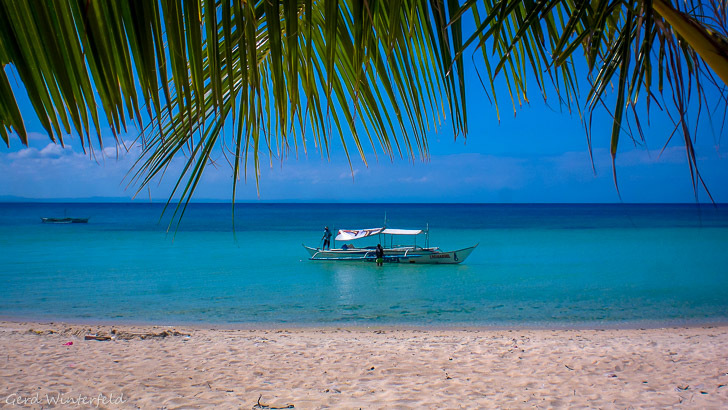 With more than 7000 islands, the Philippines have plenty of beaches, where you can spend your day, swimming in a blue lagoon or a waterfall, diving, fishing, sailing plus anything else you can do in the water. Some people come to the Philippines and want to stay in or at least near a big city, because they want to stay near a hospital, have their children go to school or university or they simply like the fact of easy shopping. But don't forget that Philippine Cities are dirty, polluted and have a high crime rate. For me, it's not really fun to stay in any city in the Philippines. I don't want to stay somewhere surrounded by concrete walls and barbed wire and protect my house with hightec alarm-systems and body guards. The Filipinos are friendly and hospitable. They respect you as a foreigner and don't want to get rid of you like it is in Thailand sometimes. You should be friendly and respectful to them, too, otherwise you won't make it in the Philippines for a long term. We had a case in the neighborhood with a nasty foreigner were the Filipinos made a petition and the foreigner had to leave to another village. He was unhappy, angry and shouting to his family and neighbors, which led to the fact that he was an unwanted person.